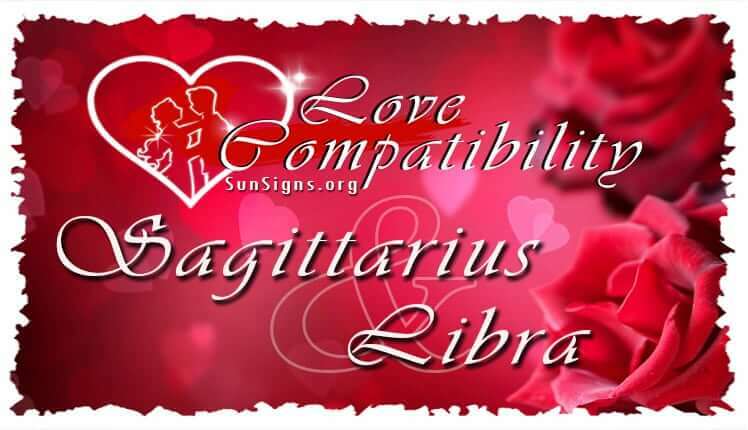 The Sagittarius and Libra love compatibility in a romantic relationship can be very happy. They will have a very balanced relationship. They will be found two signs apart in the zodiac. Because of this, they will have a very deep, special bond. They are both very understanding with each other. Sagittarius is a traveler. They are continually looking for wisdom. Libra zodiac sign has a sharp mind for beauty, art, and aesthetics. They make a stimulating friend for the Sagittarian on their trips. They will be able to add a lot to the archer’s experience. They will both keep things exciting so the Sagittarius Libra relationship will constantly feel new. At the same time, they will naturally understand each other and feel very close from the start. They can easily reach new beginnings in love and life together. Sagittarius and Libra friendship will be excellent and so will they be as partners. They will both have a certain fresh positive nature in the world. They are both excited about finding truth and beauty in their experiences. They will likely not have trouble. The Libra personality is sensitive and naturally gracious. They will not like fighting. They might be too emotionally controlling. Sagittarius might hurt their’s feelings by speaking before they think. But they will be able to smooth over any arguments they might have. Sagittarius and Libra in love will both be able to forgive and forget quickly. The planet Jupiter rules over Sagittarius. The planet Venus rules over Libra. Jupiter is concerned with luck and philosophy. Venus is concerned with love. Jupiter has male energy and Venus has female energy. Because of this, this Sagittarius Libra compatibility will be balanced and compatible. Sagittarius star sign will continually be looking for knowledge of the big things. They are curious about the truth, about the meaning behind things like life and death. Librans will think of new ideas a lot. Sagittarians will be eager to go with their partner. They will want to become familiar with the new concept. Sagittarius is a Fire sign and Libra is an Air sign. They will have a lot of kinetic energy. Air will spread fire and make it grow exponentially. The relationship will be heated and enthusiastic. Sagittarius will seem to be the one steering the relationship. However, Libra will be the one to control things behind the scenes. They are both energetic to the extreme. They can easily run together far and wide. The Sagittarius Libra compatibility will be a smooth relationship if the archer feels that they have enough freedom and independence. Sagittarius is a Mutable sign. They have a lot of flexibility and is adaptable. They will not mind the Libran making changes to their plans. Libra is a Cardinal sign. They will be the one to start things. They will think up new ideas and new places to go. However, they can change their mind on a whim. The best thing about the Sagittarius and Libra love compatibility in a romantic relationship is that they are both interested in cultivating knowledge. They will both want to use intellect. Sagittarius and Libra soul mates will work well together. They can accomplish a lot together both emotionally and geographically. Sagittarius dating Libra will work well together because they are looking for comparable things in life. Libra is the idealist of the zodiac. They will always look for perfection. Sagittarius personality is the adventurer of the zodiac. They will be looking for the next great thrill or a new learning experience. Sagittarius Libra compatibility will be playful and good-natured. They will have relationship based on a strong friendship. They will both like each other a lot. The archer likes to explore. The scales will find this stimulating. They will be willing to let the Sagittarian have the independence they need. Libra men and Libra women have a vivacious love of life. Sagittarius is fascinated by this. They will be more than willing to give their lover more commitment than other zodiac signs. The idealist might be able to tame the adventurer. The Libran can do this by asking the archer to stay by their side rather than demanding it. The archer might want to explore but they will always return to the Libran. Because of this, the Sagittarius Libra love compatibility will have magic. In a Sagittarius and Libra marriage both are very intelligent. Libra will adore learning. They will take control in the relationship. Other people might not think that the Libra would be the one to do that, but they will. Sagittarius will bring wit and insight to their meeting of the minds. They are flexible and they will be more than willing to follow their partner’s plans. At the same time, Sagittarius will need to keep their independence to be able to follow the Libra’s plans. Because of this, the Libran will feel like they are in control of the relationship. The Sagittarius Libra in bed will have an exciting approach to a physical relationship. Both star signs will be flirtatious in their own way. Sagittarius and Libra are sexually compatible and are noted for being able to flirt without each other feeling threatened by the behavior. Sagittarius and Libra in love will be able to learn more about their compatibility when they consider their ruling planets. The planet Venus will rule over Libra. Venus is romantic. They will be the one to be looking for a pure expression of love. The planet Jupiter will rule over Sagittarius. Jupiter will be bountiful, positive, and kind hearted. They will be the one to look for happiness and justice. They can both be very fair minded. The Sagittarius Libra soul mates will both be open minded. They will both want to give each other an honest hearing. Sagittarius is a fire sign. They will have a short temper. Libra is very gentle and has a calm and rational attitude. Sagittarius will be less likely to show their temper to them than to any other sun sign. Because of this, they will win the archer over. The Sagittarius Libra relationship might have some tough patches. They will both be looking for a new horizon. Libra is gentle and emotional. Sagittarius is blunt, tactless and restless. Because of this, the Libran can have their feelings hurt. They will lose patience and have a hard time making decisions. The ruling planets of Venus and Jupiter will give the Sagittarius Libra compatibility a fresh nature and zest. The influence of the planets will make it easy for them to overcome any arguments that they might have. Sagittarius and Libra are two signs apart in the zodiac. They will have a natural romantic compatibility. They will easily be able to be more compatible than other zodiac signs. They will have a sense of happiness in their relationship. They will both approach life with an attitude that is motivated. They will both be more than willing to compromise. They will both be resourceful in finding ways to help their relationship grow. Sagittarius and Libra will be more compatible together the more time they spend together. They will learn more about each other the longer they are together. If they can overcome their differences then the Sagittarius Libra breakup can be avoided. Sagittarius and Libra couple are both cheerful. Love will be an adventure with them. The adventure will be idealistic when both Sagittarius and Libra in love are both completely committed. They both know how to help each other when they need to. They will likely not put down roots in the traditional way. They will continually be looking for something. However, they will likely stay happy and in love together. They will travel forward together. The Sagittarius Libra compatibility will be excellent and they are both going to be excited to see what life brings them next.